In 2004 I created a little sculpture called Success. An office worker is sitting in a nice suit at his desk, dazing off in the distance as his fingers linger absent-mindedly near his computer. It's a personal statement about how we look at success and what it means to be "successful". It is a portrait of myself before I left my former career to pursue art full-time and it has resonated with a lot of people. 9 years later, as part of my premier art exhibition Piece By Piece, the idea was expanded by telling a narrative via a series of comic-book-like "panels" comprised of additional models. The models, together, create a storyline on either side of the "Success" piece that we call the "Success Story". 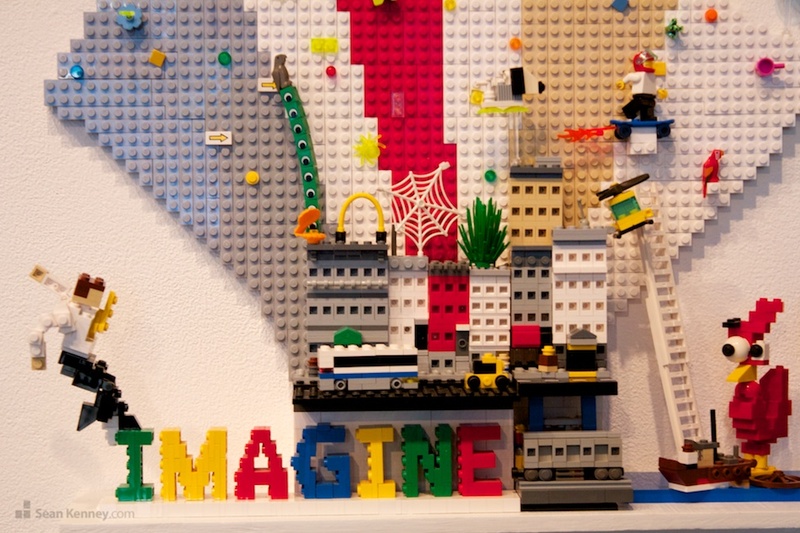 This was set up as part of the entry into my art exhibit, not only literally telling you the tale of my flight from the corporate world to a life of LEGO play, but it also mirrored the visitor's experience of walking in from the serious streets of Manhattan and into an exhibit of silly giant LEGO sculptures.